The Zwaardvis pedestal for my settee table no longer tightens. Inside the lower section I found the broken piece of plastic which used to push against the upper section to hold it in place. I emailed Zwaardvis about a spare part, but I haven't heard back. Has anyone had this issue? The only alternative solution I've thought of is to put a longer threaded rod on the locking knob and drill holes into the upper section for the rod to go into at the upper and lower locations. lots of parts here - is one of them what your looking for?? Eric, I was CERTAIN that I found that collar piece on Defender last year, but now the Internet is giving me the runaround. That tightening piece also broke off on our vessel inside of the collar. A friend gave me what looked similar, but of course the dimensions were off. 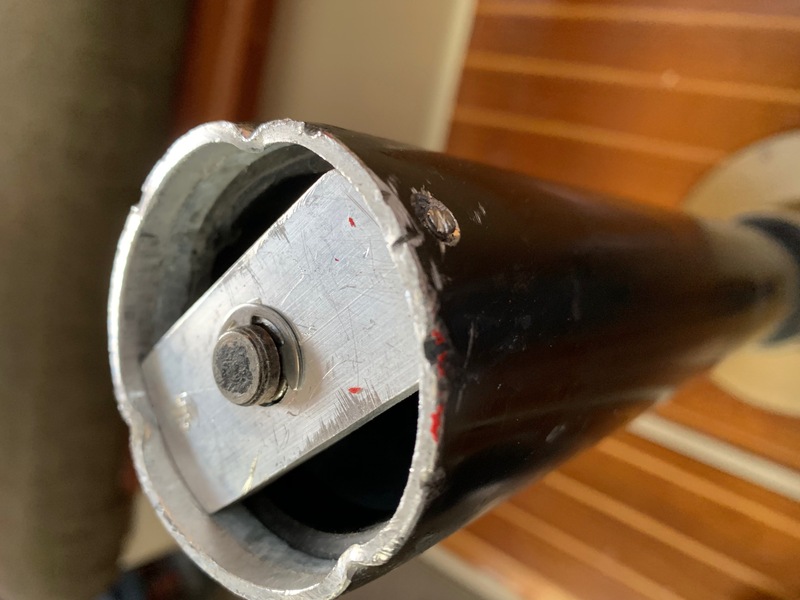 In desperation with guests coming to the boat I drilled a hole through both aluminum tubes with the Admiral sitting on the tabletop to hold it down. Not pretty, but it works. 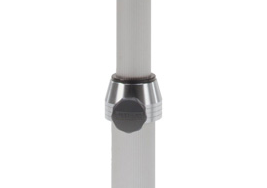 Leslie's suggestion leads to a new assembly to replace the entire pedestal, either at about $200 USD for the manual model, or $320 for the hydraulic version. Has anyone else sourced just the collar and have a source and/or part number? The plastic top piece in my pedestal that keep the strut centered was broken. I couldn’t lower the table. I used my CNC router to make an aluminum replacement. Works great now. I can cut another for parts and postage. Thanks for the offer, Leslie! I'm not sure we're talking about the exact same part. I need to get down to the boat to re-familiarize myself with the piece as I have found no 'exploded view' diagrams that might specify the details. I do believe that the plastic collar/sleeve ALSO kept the telescoping aluminum tubes aligned, but most important was the 'tongue/tab' that the lock pin pressed against to hold the top tube down against the pressure of the hydraulic cylinder and prevent the pressure bolt from digging into the aluminum. This sleeve fits inside the cast aluminum outer collar. Looks like, from the German manufacturer/distributor, Lande Marine, this entire pedestal with the gas cylinder is a "Zwaardvis Sigma PD I table pedestal, for pivoting/removable table top, Powermatic adjustment 450-755 mm (17.5" - 30"), flush mounted base, part #36690 at a price of $233 Euros". Catalina Direct has the piece, but when I tried to replace it I spent an hour pounding off the old one and another hour pounding on the new one only to discover that the top section would not fit into the lower section. So another hour pounding off the new piece and used a blowtorch and ended up back where I started. That was no fun. Here is a photo of the part I replaced. I agree it seems like a different part from model. Is that photo the very bottom that goes into the floor? If so it has been altered- mine was touching the hull so I tried to grind down the plastic end an 1/8 inch and ended up weaking it and so the piston broke out the end. That photo tells me I can fix that end with an aluminmum plate I think. That is a photo from the top. The bottom has a similar plastic piece. It the strut is not in the very center it is hard if not impossible to collapse. Note you don’t see the recess in the plate so the cut clip can fit. I had the same issue last year and ordered a complete new pedestal direct at the maker Portner Zwaardvis. It was an easy swap - the original floor-base could be used. I had a similar experience as Tad with trying to use the replacement collar insert from Catalina Direct. It was a ton of work getting the old one out and then pounding the new in, only to find that the top part of the column didn't fit in the collar once it had been pounded into the lower section. The old collar looks a bit different and is painted gray, whereas the newer one is stainless steel. I'm guessing the Cataline Direct replacement part fits the newer collar. Sounds like the model I listed above is the too-tall version at a minimum of 17", meaning that the SIGMA model is incorrect (apologies, I could not get down to the boat to measure). Sounds like Durk had success with the OE #36604 OMEGA PR II, American part number Z80-2603VEL26PM is the right one. EricH, if you can let us know with a post after installing that would be great!